Discovery Student Adventures is a member of the United States Tour Operators Association (USTOA). 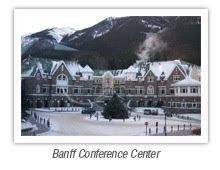 In December, USTOA held their 31st annual conference and marketplace in Banff, Alberta, Canada. The weather was incredibly cold at -22 F on Monday of the conference, and I heard the temperature had dropped to -33 F by Tuesday. The Fairmont Banff Springs was our home from Sunday to Friday. Styled after a Scottish Baronial castle, The Fairmont Banff Springs is located in the heart of Banff National Park, a UNESCO World Heritage site. A small group of California tour operators founded USTOA in 1972. These founding members recognized the need for a unified voice to protect the traveling public, as well as to represent the interests of tour operators. In 1975, USTOA became a national organization with headquarters in New York. USTOA's motto is "Integrity in Tourism." Accordingly, the association has established some of the highest standards in the industry for their members to follow. Among USTOA's goals is to foster a high level of professionalism within the tour operator industry, a vision shared by all of us here at Discovery Student Adventures. The first few days of the conference are reserved for the annual membership meeting and the active member board of directors meeting, which are open to all active members. The majority of the second day is set aside for various workshops designed to improve the knowledge of each individual company. Selected members share their experiences and best practices with all members. The last few days of the conference are set aside for various vendors to speak to active members and share their service offerings. I was invited by USTOA to present in two educational conference sessions this year. The first session was titled “Preparedness through Crisis Management Planning.” In this session, I was asked to describe our extensive on-call support system and escalation process. The on-call support system is the process we have in place to support, manage, and ultimately resolve situations that may arise while a student is traveling on one of our programs. I was joined by Rakesh Dewan, director of Worldwide Operations of Tauck World Discovery, who also shared what his organization is doing. 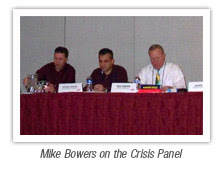 The next portion of my presentation was designed to help educate the members on how to take an emergency response template and transform that guide into an effective formal response plan. The second training session of the day focused on the current status of the H1N1 pandemic and how organizations can better prepare to minimize the pandemic’s effect on their travelers. The session started off with a very informative global update by Dr. Grant Tarling, chief medical officer for Princess Cruises International. Dr. Tarling leads a shipboard team of 60 doctors and 150 nurses on 30 cruise ships worldwide and is responsible for the medical and public health care provided to 1 million passengers and 20,000 crew members each year. Dr. Tarling highly recommends that everyone get the H1N1 vaccination, especially those under the age of 24. I have had both the H1N1 vaccination and the normal seasonal flu shot, as have my sons and wife. After Dr. Tarling’s presentation, it was my turn to share our plans for controlling the number of influenza cases on our programs. I explained how each member could take specific steps to help an organization better control its chances of eliminating the virus on its programs. Based on the feedback we received at the conference, I believe these presentations were timely and of great value to the active members of USTOA. Now, you may ask, “Why would Discovery Student Adventures share its secrets of success with operators who potentially compete for the same customers?” The answer is very simple; our focus is the safety and health of all travelers, whether they are traveling with us or our competition. When we have learned by experience, we feel it is our responsibility to share that information with others in our industry to make international travel safer for all. In return, others become more open to share their successes, and ultimately we end up with a very strong network of experienced, credible operators working closely together for the betterment of all travelers. We believe we need to actively pursue calibration in the industry, and USTOA clearly shares that vision with us. Next year, USTOA will hold their 32nd annual conference in New Orleans, and we look forward to attending and sharing what we will learn in 2010. I hope we can help all travel-related organizations enhance their health and safety practices, and gain new ideas from our peers as well to ensure the safety of every People to People Ambassador Program delegate. Let’s just hope it is a little warmer then it was this year! With that, I wish you the most exciting and safe travels. Welcome to the Discovery Student Adventures blog!